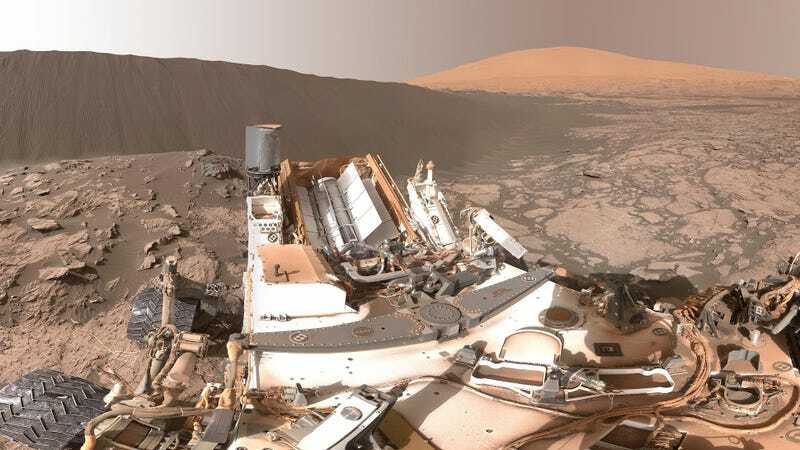 NASA’s Curiosity rover is currently investigating a chain of Martian sand dunes, offering an unprecedented glimpse of these dynamic—but strangely familiar—features. Over the past several weeks, Curiosity has been investigating the Bagnold Dunes, a series of dark sand dunes that run across the northwestern flank of Mt. Sharp. These dunes are considered “true” dunes because they feature a steep, downwind slope called a slip face. Sand that blows across the windward side of these dune eventually become protected by the dune itself. This sand progressively builds up on the slope, and eventually flows in mini-avalanches down the face. The 360 degree panoramic image above shows the downwind face of Namib Dune, including a portion of Mt. Sharp on the horizon. Click on the image to make it larger, or click here for hi-res wallpaper sized versions. The image was captured by Curiosity’s Mastcam on December 18, 2015. Owing to the cylindrical perspective projection, the probe itself appears warped, notably sections at the bottom of the photo (don’t worry, Curiosity is just fine). The dune that appears closest to the rover is about 23 feet (7 meters) from the camera, and its inclination is about 28 degrees, extending to a height of about 16 feet (5 meters) above the base. NASA says that dunes like these move upwards of 3 feet (1 meter) each year. A second photo released by NASA shows a grey scale panoramic view of the same sand dune. This is the first time in space exploration history that a rover has explored an extraterrestrial sand dune up close. NASA also provided an annotated image of the dune, along with some explanations of the features. Horn: where sand is escaping from the dune’s lee slope and moving downwind. The ripples overlying the bedrock indicate the escape of the sand. These remarkable composite Mastcam photos reveals some of the finer details of the dune. Now take a closer look to see the beautiful ripples of alien dust. The image was adjusted to approximate white balancing to make the sand appear as it would under daytime lighting conditions on Earth.